Got Tickets? Got your Flight Crew Badge? 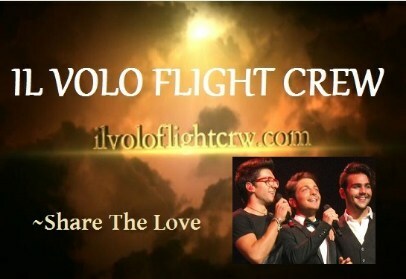 Are you ready for Il Volo? Would you like to meet other Crew Members? Here’s the “Who’s Going Where” List so far. Please update me, in comments, if I have it wrong or your name is missing. It will live over there on your right under “Topics”. I will also re-post it here from time to time throughout the 2017 concert season. Now for that necessary disclaimer: It is not our intent to make any connections with this list. It is merely to show you where people will be attending. As always, use common sense. March 9th ~ Washington D.C. Previous PostMy Opinion and More From Dario GerardiNext PostEven Amazon Knows! Aloha ladies. No need to post this comment. Just a little FYI. Melinda and I will be at the concert in Taormina on June 1. We’re currently listed with the folks in Verona. I wish. Of course I had to look at a map to see if it was possible to do both. Silly me. Marie, makes me laugh a lot your name added to the list at the bottom of Verona on May 19, perhaps seeing your name listed you decide to come. You could always add 19 May my friend Maura (the letter)? I also wanted to tell you that Maura Siena has already told you twice to enter her name and also that of her husband even in Livorno concert, but you have not yet corrected. Then I wait for Verona so we go together. I am pleased to report that Rosalba and I now have tickets for the London concert as well as the one in Naples. I must thank Daniela for her help in buying the London tickets on the day before they went on sale. For those who do not know, the Royal Albert Hall is one of the most prestigious concert venues in the whole of the United Kingdom. Think Carnegie Hall in New York and you will get the idea; but the RAH is slightly older. So, it is a remarkable achievement that our guys are performing at the RAH. We will go to two concerts in 18 days and will have a holiday in Italy, too. So, there is no longer any need to feel sorry for me! Bernard, so happy you will also be at the RAH concert. I was feeling bad for you only going to Naples for a concert and a holiday. What a relief. Now, I can sleep nights! Hi Marie! My aunt Patricia Jamison and I will be at the Minneapolis concert. Can’t wait! Hello Laura! Got you both on there.